It’s Detroit’s turn to shine. You heard it correctly. 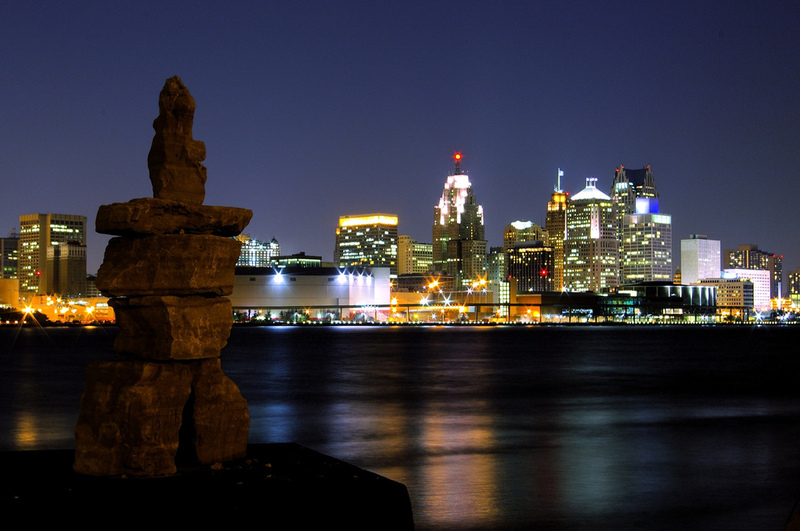 Detroit, Michigan is on the rise. Finally. The long-forgotten and often disparaged city is making a huge comeback. This is your chance to see it before everyone else catches on. Last night, you started to get cold feet as visions of the declining automobile industry, the 2008 recession, and boarded up Downtown Detroit started dancing through your head. But it was too late. You were already in the air and heading to DTW. It wasn’t the airport that you were worried about. As a major international hub, you’re quite familiar with Michigan’s largest airport. You always headed west or way north once you landed, though. The Motor City was never an option. But our hesitation dissipated as soon as you saw your hotel. The Detroit Foundation Hotel is right across the street from the Cobo Center. Its five-story building is the former Detroit Fire Department Headquarters. Like many spaces in the city, the Neoclassical building sat empty when the DFD moved out in 2013. But it didn’t stay vacant for very long. The boutique hotel opened last spring. It kept the brick facade, the massive archway doors, and the soaring ceilings. Fire poles stayed in what became the restaurant, as well. While local artwork, photographs of historic Detroit architecture, and lots of carefully curated amenities were added. It’s now a chic place in which to both hang out and stay. 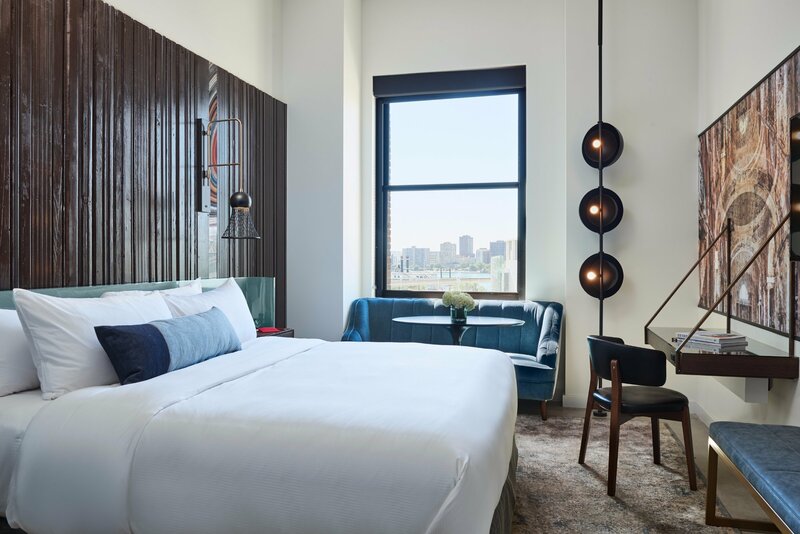 The Detroit Foundation Hotel was buzzing when you checked in. There was an uncluttered lobby, an art-filled hallway, and a packed restaurant on the first floor. There’s a fitness center with both workout classes and a run club. A meeting room doubles as a podcast studio. Detroit Bikes are propped against the wall. Plus a full water bowl proves that dogs are indeed welcome. Then you went upstairs to find your room. With iron-welded door handles from Smith Shop, a leather tray from Douglas & Co., a bottle opener from Woodward Throwbacks, and an issue of TBD magazine, there was no doubting the city in which you were about to fall asleep. Now, after a great night’s sleep, you’re back downstairs in the Apparatus Room for brunch. With lots of light pouring through the huge windows and a smaller crowd, you can now see why the restaurant has a such a communal vibe. Thick wood floors, leather couches, and low-hanging lights fill the large space. The chef is originally from Michigan. He returned to create New American cuisine using Midwestern ingredients. Plus the smell of Anthology Coffee fills the air. You order coffee and a Bloody Mary as you look over the menu. Usually, you lean toward lunch. But sweet potato pancakes—served with cranberry, spiced nuts, and butter—are loudly calling your name. After a hearty brunch, you’ll be ready to start exploring the Dequindre Cut Greenway, Lincoln Street Art Park, and the Eight Mile Wall. Your server also suggests the Heidelberg Project when you mention the local art scene. With so many options, there’s no way Detroit will stay quiet for very long.